Soon after its publication in 1987, the first edition of Ultrafiltration Handbook became recognized as the leading handbook on ultrafiltration technology. Reviews in professional journals praised it as an authoritative and substantive information resource on this technology. 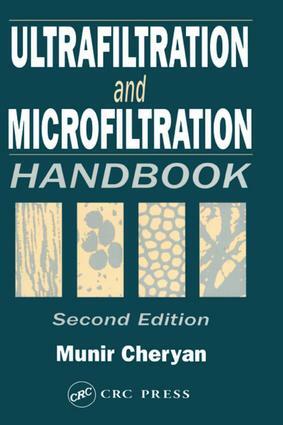 Now a completely, updated and expanded edition is available under the title, Ultrafiltration and Microfiltration Handbook. This practical handbook systematically covers the basics of this technology from its scientific fundamentals to a wide range of industrial applications. The presentation is clear and concise with the emphasis on practical use. Many schematics and micrographs illustrate membranes, equipment and processes. Numerous tables and graphs provide useful data on specifications and performance. The updated information is useful to all those involved in the use of separation and filtration in industrial processes. "The value of this work lies in the extensive compilation of information on ultrafiltration membranes and their applications. The engineering aspects of ultrafiltration are also dealt with thoroughly." "A comprehensive textbook on ultrafiltration has been needed for some time. Such a book is now available . . . it is well-written and useful. . . "
"This book is a comprehensive reference. . . . Recommended for engineering collections." ". . . Ultrafiltration Handbook covers all aspects of ultrafiltration. The book is too well-written and easy to read to be a reference, but its too fact-filled and thorough to be anything but a reference book . . . .If ones work in any way involves separations technology, this handbook is invaluable." "Overall, the book is well organized with a clear and attractive lay-out. . . . An excellent book which will undoubtedly become a standard work of reference both in companies manufacturing and utilizing UF systems. It contains a wealth of useful practical experience which is not to be found in much of the literature, thereby fulfilling a major criterion of any work represented as a handbook. . . . It is a very good value indeed." "It contains a wealth of information about the UF process, and it would be an excellent addition to any library. In addition, it would make an excellent textbook for teaching the fundamentals of UF." "I have profited much by the vast amount of useful information given in the book. Since your approach to the subject is popular, and your style of writing is appealing, the book is bound to be a . . . success." Experiment vs. theory: the "flux paradox"